The above mentioned study has been conducted by LABRHA to obtain pilot data from daily practice conditions of HAppyCross® (HANOX-M-XL) in patients with knee osteoarthritis (KOA). All patients have received a single intra-articular injection of 4.4ml of HAppyCross®, a viscosupplement made of a cross-linked HA (16 mg/mL) + mannitol (35 mg/mL), in the target knee. The primary outcome was safety, to demonstrate that 4.4 ml is well-tolerated in the knees. The secondary end point was pain relief over 6 months. 4.4 ml of HAppyCross® can be used without safety concerns. Indeed, tolerability of HAppyCross® was absolutely similar to that of regular viscosupplements not containing mannitol, demonstrating that the addition of mannitol to HA does not modify the local or general tolerability of viscosupplementation. 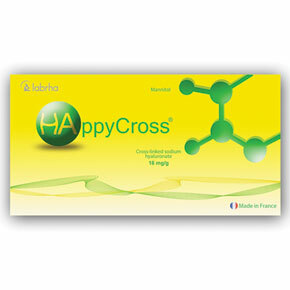 4.4 ml of HAppyCross® allows a long-lasting pain relief and a significant decrease of analgesic consumption. In case of Grade IV OA, 4.4ml of HAppyCross® is effective and ensures a pain relief over 6 months. No other studies have demonstrated this so far for a 6 month outcome in Grade IV OA. Controlled trials are needed to confirm these pilot data.